Both trucks are approximately the same price and are compatible with pretty much any of the 18" doll brands (American Girl, Journey Girls, Madame Alexander, My Life, Our Generation, etc) plus each toy vehicle has working wheels to facilitate a pretend driving experience. 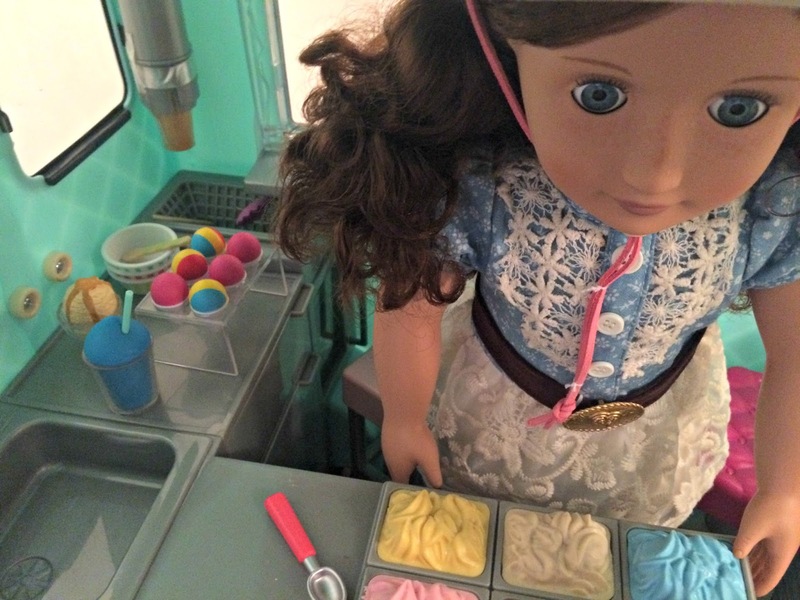 Each comes with accessories that include miniature kitchen utensils, such as ice cream scoops and tongs, and imitation food, like doughnuts and sundaes, for kids to play with. 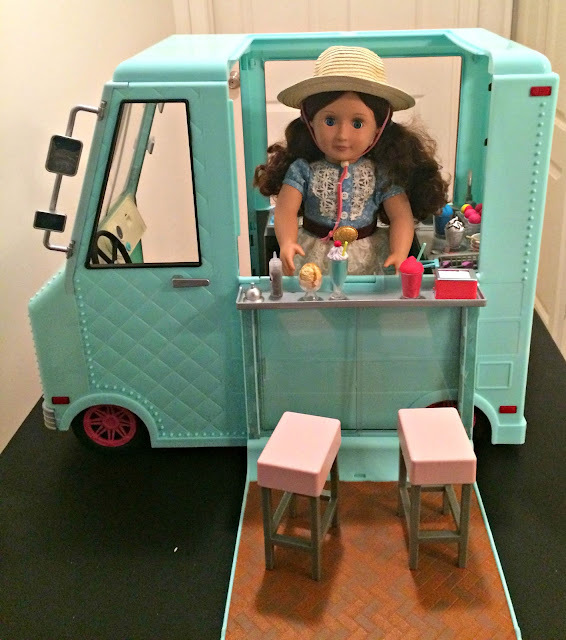 My Life's version has more of a food truck theme including hot dogs, hamburgers and shish kabobs among the 40 accessories that come with the toy. Our Generation's vehicle has a more limited desert focus but provides substantially more accessories with 120+ items included aimed to stimulate creative play. 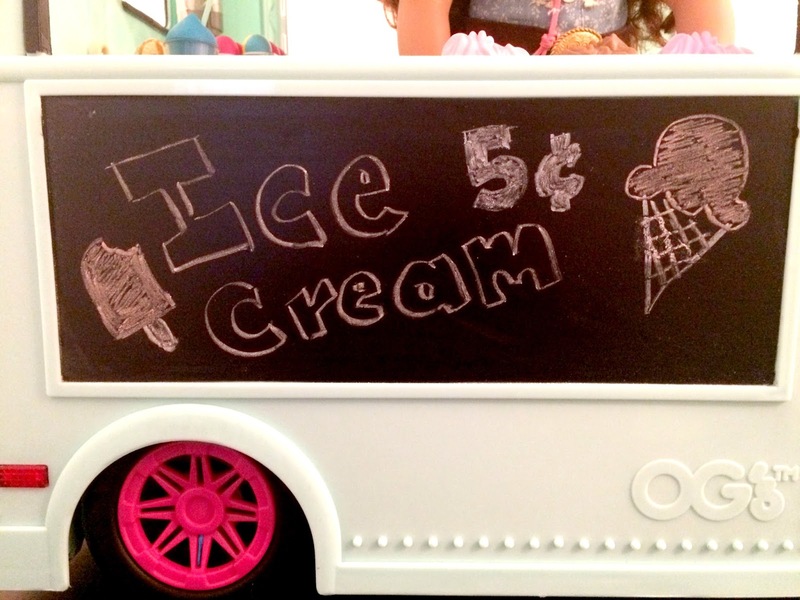 Each truck also includes a chalk board for kids to have fun drawing on. The chalk board on the My Life truck flips up from the roof and comes with one piece of white chalk. The Our Generation version is on the side of the vehicle which provides a larger more stable surface and comes with multiple pieces of chalk in a variety of colors. The two vehicles differ significantly on how to access the kitchen section of the trucks. The Walmart version separates from the rear allowing great playtime access to this area but by splitting in half it also sacrifices stability making the My Life truck not as structurally sturdy as the Our Generation one. Our Generation's truck has an opening roof that provides adequate but more limited access to the area than My Life's. 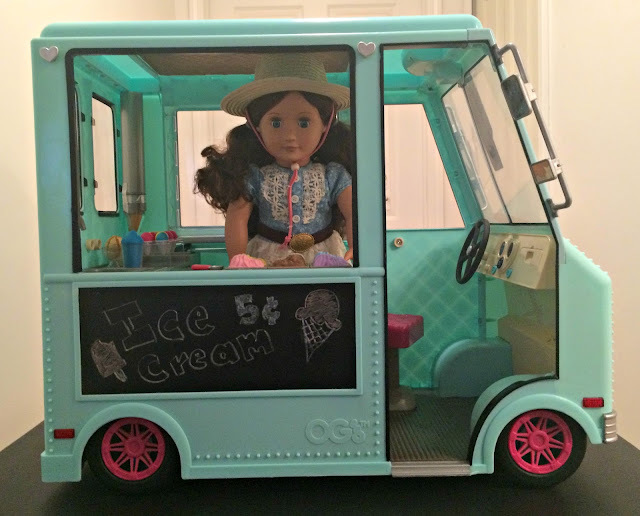 While it may provide a more limiting play space than the My Life version, the Our Generation ice cream truck makes up for it by providing a toy vehicle that isn't as flimsy making it easier to roll around on its wheels and more durable for withstanding the carefree play of children. 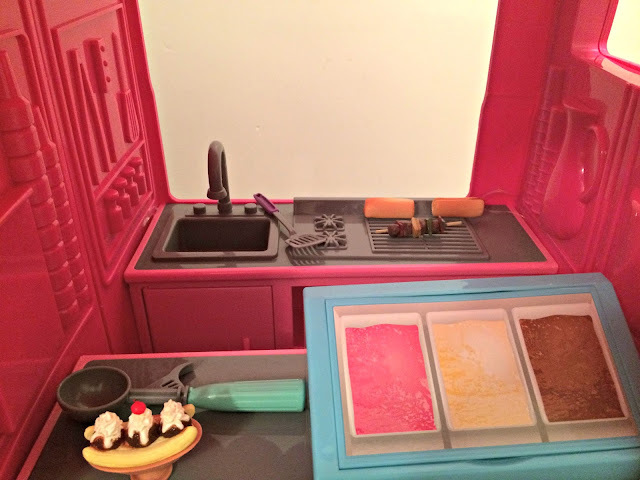 The kitchen area in the Our Generation model is also much more detailed with removable trays of imitation gelato on display, compared to My Life utilizing stickers to represent the same thing, for instance. While the My Life just has several open shelves within its kitchen for storing the included accessories, Our Generation provides a fridge, freezer and cupboard with multiple doors to open and close. 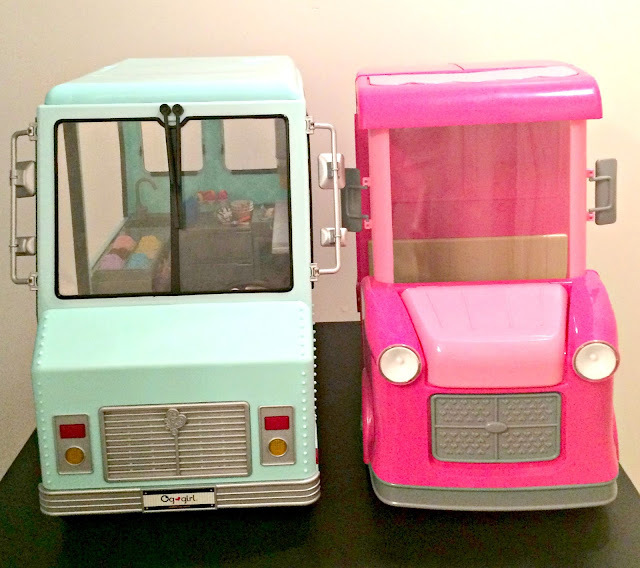 There is just a lot more attention to detail and realistic elements when it comes the the Our Generation ice cream truck compared to the My Life toy vehicle. What really differentiates the Our Generation truck from the My Life one are the special battery operated features that it provides. My Life's model doesn't provide any type of these features. On the other hand, the Our Generation version has working windshield wiper action, headlights that turn on, rear lights that illuminate when the brake pedal is pushed down, and turn signal lights that activate when the steering wheel is turned left or right. We have an ice cream truck that roams our neighborhood every summer playing tunes so you know it is coming down the road and can be waiting for it with your money to buy a treat. The Our Generation ice cream truck plays tunes too! Press the music button on its dashboard and it will play one of three songs. Sweet! Another nice touch is that the Our Generation Sweet Stop Ice Cream Truck comes with batteries so it is ready to go right when you get it home. Just note that you need to adjust a switch on the bottom of the vehicle under the front license plate from demo to play mode to get all of these neat features to work properly. The instructions that come with it could probably highlight that point a bit more prominently. 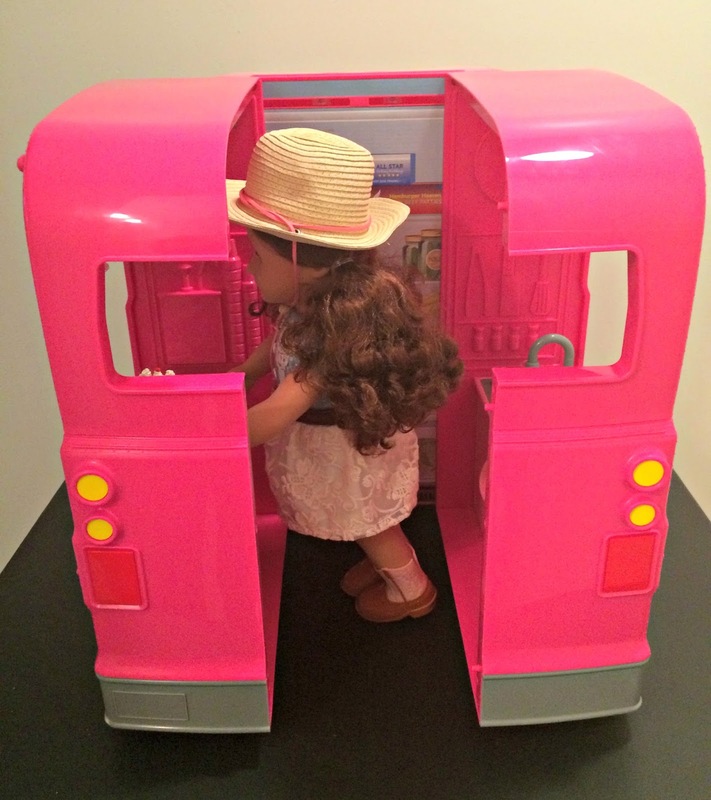 There are some nice aspects to the My Life truck such as being able to have two dolls ride together in its front cab and the openness of its kitchen area but when sold for approximately the same price as Our Generation's version it just doesn't compare. With it being a more sturdy and durable toy along with the impressive battery powered special effects and incredible number of included accessories, the Our Generation Sweet Stop Ice Cream Truck really overwhelmingly comes out on top between the two models. The Our Generation ice cream truck really is a sweet ride! 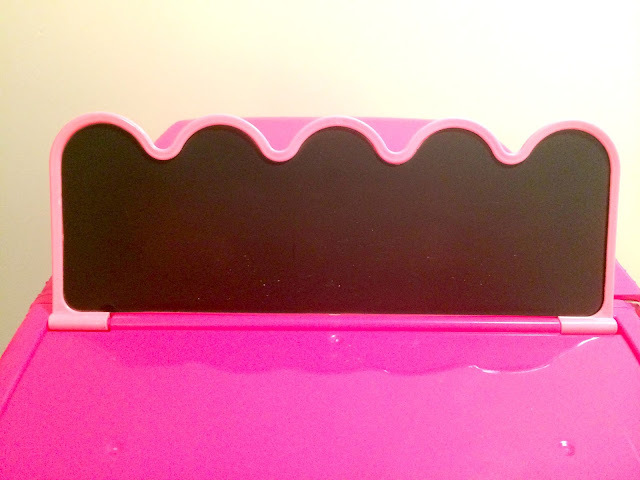 Disclaimer: A Geek Daddy received the featured products for free to review. My daughter received the Our Generation ice cream truck prior to Christmas as a reward for doing well in school and because she caught wind of us doing this review. The My Life toy vehicle was repackaged as good as new and provided to a holiday toy drive for underprivileged kids. A Geek Daddy did not receive any financial compensation for this post. Opinions are honest and my own.